BANGI, 10 Ogos, 2010 – The Science and Technology Faculty (FST) that was re-structured in 1999 has made a major contribution to the overall performance of Universiti Kebangsaan Malaysia (UKM), said Vice Chancellor Prof Tan Sri Dr Sharifah Hapsah Syed Hasan Shahabudin here today. 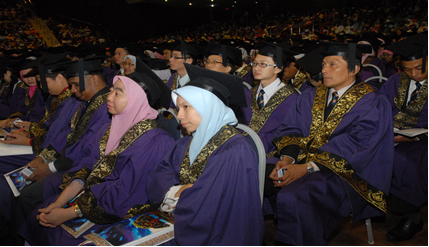 Several new programmes to the country were first introduced by this faculty, she said during her address at the seventh session of the 38th convocation ceremony of the national universiti at Dewan Canselor Tun Abdul Razak (DECTAR). 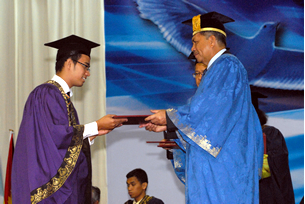 Among the degree programmes were Actuarial Science, Nuclear Science and the Quality and Productivity programme, all of which were unique in that they were based on mathematical science. FST also chalked up a first in pioneering a double post-graduate degree programme with the Institute of Technology Bandung (ITB) where the students studied one year in UKM and the other year in ITB for a double Master degree in Petroleum Geoscience. This cooperation programme between the two institutions had attracted 10 Indonesian students, one Iranian and one Malaysian. “I congratulate this first batch of graduates of the double Masters degree programme called Master of Science (Petroleum Geoscience) in UKM and Master of Petroleum Geophysics in ITB. FST, she pointed out, had succeeded in bagging research grants of RM81.6 million in three years from 2007, for 430 research projects. Prof Sharifah Hapsah also said that several of research results had attracted the support of the Malaysian Technology Development Corporation (MTDC) to set up the university’s companies. The researchers too had received recognition and were invited to sit in the national and international organisations. Professor Gires Usup formerly Head of the UKM’s Marine Research Station was selected to head the Global Ecology and Oceanography of Harmful Alga Blooms or GEOHAB Asia. In term of publications, FST has succeeded to enhancing the use of the Malay language in science and technology at the national and international level through the “Jurnal Sains Malaysiana” (or Malaysian Science Journal) which were listed in SCOPUS and ISI Thompson. Later, in her address at the last session of the convocation in the afternoon, she as part of the university’s internationalisation programme, the Nuclear Science Programme of the School of Applied Physics, had successfully held the Winter School On Nuclear Science and Technology with the University of Bordeoux, France and the Summer School on Nuclear Engineering with the Korean Advanced Institute of Science and Technology (KAIST). Prof Sharifah Hapsah’s speech was read out by the Deputy Vice Chancellor (Academic and International), Prof. Dato’ Dr. Ir Hassan Basri. She said those programmes were very strategic for the nation in preparation for the possibility of using nuclear energy when the country’s oil and gas were exhausted. One of the special attractions of UKM in its garden of knowledge was its “living labs” which were research stations in several places in the country. These stations at Langkawi, Tasik Chini, Bukit Fraser, Mersing and Lata Jarum had provided the students with a unique learning experience in physical ecology and humanities. They also provided an opportunity for the students and lecturers to contribute to the development of the local communities, she added.